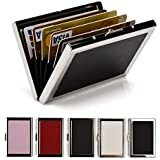 Protect your credit cards and hard earned cash with this assorted, set of 6, Aluminum Metal Credit Card Wallet Holder . 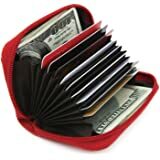 Each wallet contains expandable pockets that will neatly organize your cards and bills for effortless access and use. For added functionality, the wallet also features a click button for easy opening and closing. 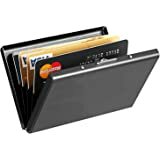 The outer shell is made out of aluminum which help absorb most impacts and shocks, keep it stain-resistant and even blocks RFID tags that are now embedded in some credit cards, preventing identity theft. This set contains one of each color :black, red, green, purple, blue and silver. Size: 11x7x5.2cm . 1.0 out of 5 starsCHEAP...Not Worth It! Though the colors are great, and I love metal and a hard case, the latch and the inserts are cheap, cheap, cheap. At least one of the latches already broke and the plastic inserts are ripping already. Such a waste! 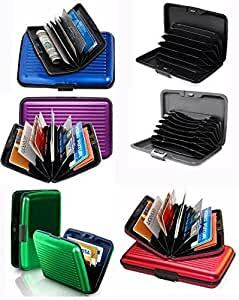 I bought this set as I wanted to separate cases/wallets into 4 separate color-coded wallets...my 2 businesses each with their own cases/wallets, a personal one, and one for rewards/customer loyalty cards. 2.0 out of 5 stars5-star for the first month.....then 0-stars when it starts falling apart....cheaply made! Worked for awhile and it was great. However, it is hinged with cheap plastic and the plastic hinge wears out, doesn't close properly. 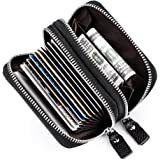 I would love this if the product was improved...and I would be willing to pay more to ensure that my cards are safe....AND that the wallet doesn't fall apart on a monthly basis. I rip out the innards so I just stash credit cards, license, car insurance card and some cash inside. I can hold more this way. I have no issues with the case. Sometimes it comes apart because I tried to stuff too much inside it, but the two sides snap back together easily. Fits in pants pocket. Easy to grab when I don't want to carry a purse. I have given a few away as gifts. Prior to these, I used to use Sucrets boxes to hold cash! These are much nicer and hold more than cash! I was so disappointed with these. First of all, they're plastic, not aluminum. 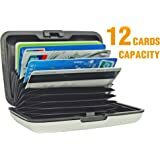 The place where you put your cards in a file is cheaply made. I could put this in my pocket, sit on it, and it would break. I'd never trust my id or ATM card to one of these.